Last week, activists proclaimed a "NetNeutrality Day", trying to convince the FCC to regulate NetNeutrality. As a libertarian, I tweeted many reasons why NetNeutrality is stupid. NetNeutrality is exactly the sort of government regulation Libertarians hate most. Somebody tweeted the following challenge, which I thought I'd address here. The presumption is that any sort of packet-filtering is automatically evil, and against the customer's interests. That's not true. Take GoGoInflight's internet service for airplanes. They block access to video sites like NetFlix. That's because they often have as little as 1-mbps for the entire plane, which is enough to support many people checking email and browsing Facebook, but a single person trying to watch video will overload the internet connection for everyone. Therefore, their Internet service won't work unless they filter video sites. GoGoInflight breaks a lot of other NetNeutrality rules, such as providing free access to Amazon.com or promotion deals where users of a particular phone get free Internet access that everyone else pays for. And all this is allowed by FCC, allowing GoGoInflight to break NetNeutrality rules because it's clearly in the customer interest. Comcast's throttling of BitTorrent is likewise clearly in the customer interest. Until the FCC stopped them, BitTorrent users were allowed unlimited downloads. Afterwards, Comcast imposed a 300-gigabyte/month bandwidth cap. Option 3 is clearly the best. BitTorrent downloads take hours, days, and sometimes weeks. BitTorrent users don't mind throttling during prime-time congested hours. That's preferable to the other option, bandwidth caps. I'm a BitTorrent user, and a heavy downloader (I scan the Internet on a regular basis from cloud machines, then download the results to home, which can often be 100-gigabytes in size for a single scan). I want prime-time BitTorrent throttling rather than bandwidth caps. The EFF/FCC's action that prevented BitTorrent throttling forced me to move to Comcast Business Class which doesn't have bandwidth caps, charging me $100 more a month. It's why I don't contribute the EFF -- if they had not agitated for this, taking such choices away from customers, I'd have $1200 more per year to donate to worthy causes. Ask any user of BitTorrent which they prefer: 300gig monthly bandwidth cap or BitTorrent throttling during prime-time congested hours (6pm to 10pm). The FCC's action did not help Comcast's customers, it hurt them. Packet-filtering would've been a good thing, not a bad thing. Secondly, it's not true. Time Warner provided the same access speeds as everyone else. Just because they promise 10mbps download speeds doesn't mean you get 10mbps to NetFlix. That's not how the Internet works -- that's not how any of this works. To prove this, look at NetFlix's connection speed graphis. 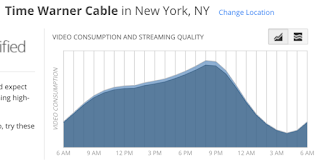 It shows Time Warner Cable is average for the industry. It had the same congestion problems most ISPs had in 2014, and it has the same inability to provide more than 3mbps during prime-time (6pm-10pm) that all ISPs have today. Congestion is an essential part of the Internet design. When an ISP like Time Warner promises you 10mbps bandwidth, that's only "best effort". There's no way they can promise 10mbps stream to everybody on the Internet, especially not to a site like NetFlix that gets overloaded during prime-time. Indeed, it's the defining feature of the Internet compared to the old "telecommunications" network. The old phone system guaranteed you a steady 64-kbps stream between any time points in the phone network, but it cost a lot of money. Today's Internet provide a free multi-megabit stream for free video calls (Skype, Facetime) around the world -- but with the occasional dropped packets because of congestion. Whatever lawsuit money-hungry lawyers come up with isn't about how an ISP like Time Warner works. It's only about how they describe the technology. They work no different than every ISP -- no different than how anything is possible. The short answer to the above questions is this: Comcast's BitTorrent throttling benefits customers, and the Time Warner issue has nothing to do with NetNeutrality at all. Net neutrality is socialism, but the alternative is the current monopolistic system reinforced by government regulation that stifles competition. So when my ISP throttled me to only being able to view 2 youtube videos per hour (less then 5 minutes each) and when they DNS black holed Spotify streaming servers, this was good for everyone? As an anti-FCC run Title II NN argument, I also like to point people to this Washington Post article. Under the previous Administration, mundane FCC powers were used to get undersea cable owners (even if foreign) to "voluntarily" agree to go beyond what CALEA and other laws require for eavesdropping. This is even though those powers did not seem related to eavesdropping. There is absolutely no doubt that increasing FCC powers over ISPs, which is what Title II does, places an additional weapon in the FCC's arsenal to compel "voluntary compliance" and discourage resistance to intelligence and law enforcement requests. They might well voluntarily cooperate anyway, so it's only a difference on the margin, but if you're the sort of person who wonders why ISPs don't resist more and wish that they would, Title II powers and the threat of them are a terrible idea. Rob, can you explain why RST packet injection is the best way (or not) to throttle BitTorrent traffic? In the Comcast case, they could have also set max bandwidth speeds, like 100 Gigabits/second. Oh wait, they already do that. If they couldn't support their advertised speeds at peak load, then they could have lowered their advertised speeds and allowed people to go faster off peak. Then you could have set up your own network to deprioritize BitTorrent traffic, and you would still have fast downloads overnight. But they didn't want to be honest about their capabilities, because it would have made them look worse. If the limiting factor is peak bandwidth quota, then that's what we should be charged for. Neither of those arguments are relevant to Net Neutrality. As you say, bandwidth management to ensure a provision of service is a key responsibility of an ISP. Net Neutrality is important because your ISP is going above and beyond the provision of a service to its customer base to imposing a fee based structure based on what they think they can get away with. Customers and content providers are already paying for bandwidth, they should not have to pay to make certain kinds of traffic go faster than the others. All packets are created equally and should be treated as such. Does that not appeal to your libertarian beliefs? Maybe Comcast could host a series of SOCKS5 proxies near the last mile. Traffic to those proxies will be low QoS priority, throttled during peak load, but zero-rated on monthly limits. I don't think the FCC expected Comcast to institute download caps in response to being forced to drop torrent throttling. They likely expected Comcast to invest more money into infrastructure or otherwise be forced to lower their advertised speeds, allowing local competitors to gain traction in the market. The FCC's only sin is its inability to follow through: It should have banned download caps as well! Net neutrality is an important incentive to invest in better networks. If you're allowed to throttle or otherwise influence the data flows this is only an incentive to make the most from the existing bandwidth, it's more lucrative to *not* invest in the network but simply to manage the existing lack of bandwidth. Title II powers and the threat of them are a terrible idea.